Can you believe that KIT KATS have been around for 80 years? Imagine the stir those delicious fingers of crunchy wafer coated in sweet, creamy milk chocolate would have caused way back in 1935! It’s a testament to the absolute mouth-watering goodness of KIT KATS that they’re still kicking around today largely unchanged. That was, until now. 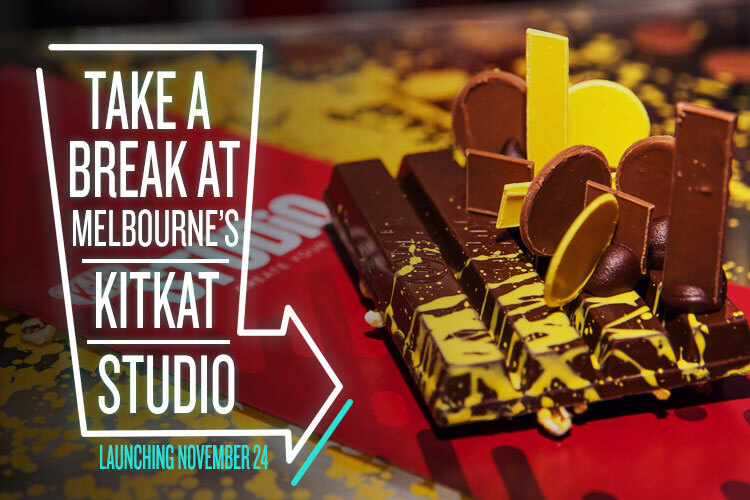 Hot off the back of its success in Sydney, the KIT KAT Studio concept store is coming to Melbourne! Throwing open its sticky, chocolate-fingerprinted doors on November 24, the KIT KAT Studio will be launched by none other than the ‘Punk Princess of Pastry’, Executive Pastry Chef at the prestigious Shangri-La Hotel, Anna Polyviou. A hometown girl through and through, Polyviou has even created a Melbourne-inspired KIT KAT. Want to know what that would taste like? You’ll have to get on down and join the queue as Polyviou remains tight-lipped about how exactly she’s planning to represent good ole Melbourne town. As the name suggests, the Kit Kat Studio allows you to create your very own KIT KAT, choosing from a range of limited edition flavours that have never been tried before. Fancy yourself as a budding chocolatier? Why not try your hand at designing the next KIT KAT bar, using premium ingredients such as tart raspberry pieces, chewy salted caramel, fragrant pink rose petals, or caramelised meringue? Feel like getting into the Christmas spirit? Not to worry, KIT KAT’s got you covered! As well as the chance to make your own Kit Kat bars, you’ll also be treated to a selection of limited edition Christmas-inspired Kit Kats, including Spiced Christmas Pudding, Butterscotch Fudge, Pretzel, Pecan, Cranberry, Pistachio, and Coconut Macaroon (are you drooling yet? Cause we sure are). With Christmas just around the corner and the associated stresses of last-minute shopping, menu planning, and decorating that are the hallmark of the festive season, maybe it’s time to have a break, have a KIT KAT. See you there!